FILE - In this Sept. 11, 2018, file photo, New York Yankees pitcher Sonny Gray throws against the Minnesota Twins in the first inning of a baseball game in Minneapolis. A person familiar with the negotiations tells The Associated Press that Gray has agreed to a contract with Cincinnati adding $30.5 million from 2020-22, a deal that allows the Yankees to complete his trade to the Reds. The person spoke on condition of anonymity Monday, Jan. 21, 2019, because the trade had not been announced. 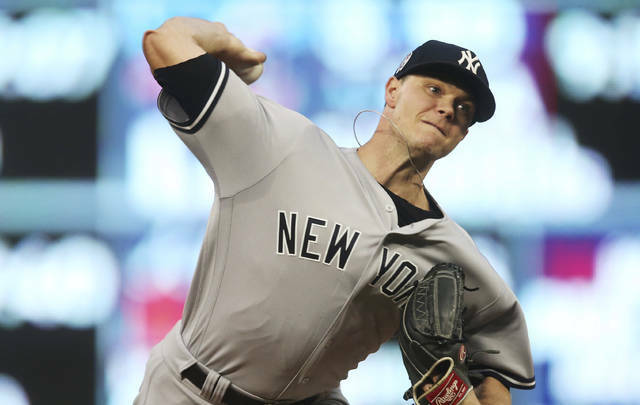 NEW YORK (AP) — Adding Sonny Gray to a rotation already improved by the offseason acquisitions of Tanner Roark and Alex Wood has the Cincinnati Reds thinking about their first NL Central title since 2012. Gray’s unsuccessful stretch in New York ended when the Yankees traded the pitcher after the 29-year-old right-hander agreed to a contract with the Reds that added $30.5 million from 2020-22 and includes a 2023 club option. New York received infield prospect Shed Long and a high pick in this year’s amateur draft, then flipped Long to Seattle for 21-year-old outfielder Josh Stowers. The Yankees sent the Reds left-hander Reiver Sanmartin. Derek Johnson, the new Reds pitching coach for manager David Bell, was Vanderbilt’s pitching coach when Gray played for the Commodores from 2009-12. Johnson lives in Nashville, Tennessee, Gray’s offseason home, and they keep in touch. New York receives the Reds’ competitive balance round A selection, currently 36th overall. https://www.limaohio.com/wp-content/uploads/sites/54/2019/01/web1_122173593-75664e6ef0a047caadd51c4520570cc7.jpgFILE - In this Sept. 11, 2018, file photo, New York Yankees pitcher Sonny Gray throws against the Minnesota Twins in the first inning of a baseball game in Minneapolis. A person familiar with the negotiations tells The Associated Press that Gray has agreed to a contract with Cincinnati adding $30.5 million from 2020-22, a deal that allows the Yankees to complete his trade to the Reds. The person spoke on condition of anonymity Monday, Jan. 21, 2019, because the trade had not been announced.